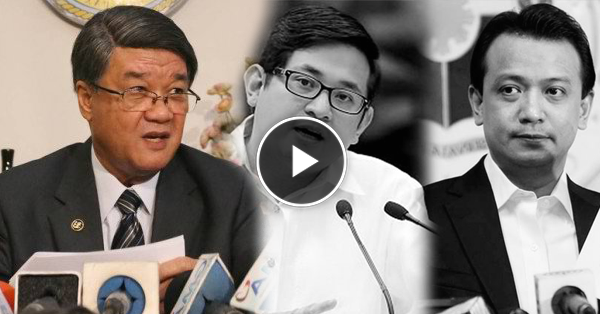 Department of Justice secretary Vitaliano Aguirre II linked senators Bam Aquino, Antonio Trillanes III, Magdalo representative Gary Alejano and Ronald Llamas, political adviser of former President Aquino in Marawi Siege. Aguirre claimed that Aquino, Trillanes, Alejano and Llamas went to Marawi to meet two powerful clans in Lanao Del Sur three weeks before the siege happened. He said that he got a photo of alleged meeting of Trillanes, Aquino, Alejano and Bam with the members of Lucman and Alonto clans in Marawi. Aguirre said that the meeting was possibly part of the ‘destabilization plan’ of the opposition against President Rodrigo Duterte. Bam Aquino, last month also went viral on the internet after his photos in Marawi City went viral and netizens claimed that the senator is there to talk with the members of Maute Terrorist Group. Aquino went there three days before the Marawi siege started and the timing of his visit made the netizens speculate that the senator was one of the people conspired with the Maute Terrorist group to destroy the peace and order in Mindanao. The members of the opposition also denied several times that they are planning to destabilize President Rodrigo Duterte so Vice President Leni Robredo can takeover the presidency.